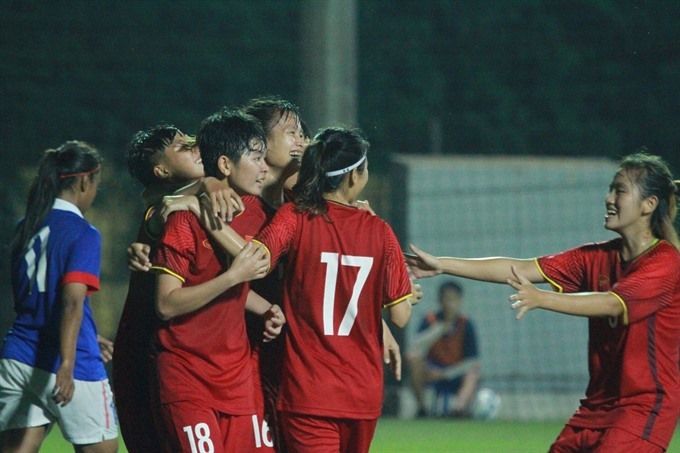 HÀ NỘI — Việt Nam’s U19 women enjoyed their first victory after beating Malaysia 2-1 in the first qualifying round of Group E at the Asian Football Confederation (AFC) U19 Women’s Championship, held yesterday at Mỹ Đình Stadium. Tipped as the favourites, Việt Nam piled on the pressure from the opening whistle. Việt Nam ended the first half in confusion. However, in the 59th minute, receiving a pass, Tuyết Ngân overtook her rival and aimed high, equalising for Việt Nam. Feeling fresh motivation, Việt Nam went on the attack and found a winner just 10 minutes later. After a pass from the left corner of the field, Nguyễn Thị Hoa showed up just in time and scored one more goal for Việt Nam. With this victory, Việt Nam had a smooth start in the qualifying round of the tournament.